Think you're Handy? Test your Skills! Start With The FASTEST Growing And Best Team! Own a Yellow Van Handyman franchise for as little as $7,999 (only $4,999 after discounts for veterans, active duty military, first-responders and clergy apply). 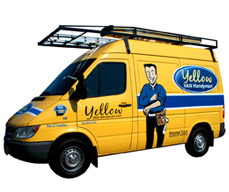 While others spend time on scheduling and paperwork, Yellow Van Handyman Franchise Partners focus on billable hours. We lead the industry in our innovative use of technology. And, it makes running your business easy. We have the systems and processes in place to make getting your business up and running easy! We'll teach you the ropes and support you as you grow. Enjoy working with your coach as your business increases.